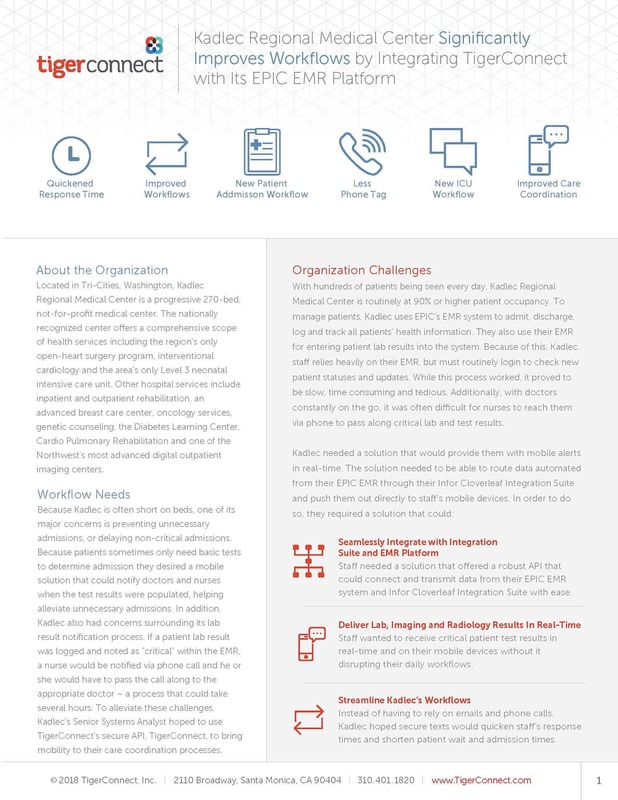 By integrating TigerConnect with their EPIC EMR platform, Kadlec Regional Medical Center was able to improve multiple processes, including receiving immediate alerts when ICU patients’ levels drop to dangerous levels. Prior to integrating TigerConnect, Kadlec’s patient admission and lab notification processes were very time-consuming and manual. While everything was being logged into their EMR, the doctor wouldn’t know the statuses unless he or she actually logged into the system regularly. By using TigerConnect to push out critical alerts, Kadlec has achieved quickened response times, less phone tag, improved care coordination, and overall improved workflows.